Gingivitis is a common disease of the gums that ranges from mild to severe. Most cases are easily treatable without any special procedures, requiring only a good hygiene regimen. However, if left untreated, gingivitis may develop into more serious complications for a patient’s jaw, gums, or teeth. To help Red Bank patients better understand the factors behind this disease and what they can do to prevent it, cosmetic dentist Michael Bixby provides the following information on gingivitis. Simply put, gingivitis is an inflammation of the gums. Although the most widespread cause of inflammation is from plaque, there are other factors that may weaken one’s gums or increase their sensitivity. Plaque buildup: For most patients, gingivitis is the result of poor dental hygiene. Neglecting to brush and floss can result in the accumulation of plaque, which is a bacterial biofilm that collects and hardens over teeth. Just as plaque eats away at teeth and leads to decay, it also irritates our gums and causes them to inflame. The good news is that plaque is easy to avoid, as noted in the treatments below. Other illness: Some illnesses can result in gingivitis if they weaken the immune system or make the body more susceptible to infection. Examples of these illnesses include HIV, cancer, and diabetes. Obviously, gingivitis alone should not be used as an indicator of any such diseases. Hormonal fluctuations: A patient’s gums may become more sensitive in times of hormonal change. Menstruation, puberty, pregnancy, menopause, or drugs that alter one’s hormonal balance can all increase the risk of sensitivity in the gums. Tobacco: Smoking or chewing tobacco inhibits the ability of gum tissue to heal, occasionally leading to irritation and inflammation. When a patient’s gums are inflamed, they will appear more red and swollen than normal, most noticeably around and between the teeth. They might feel unusually tender or sore, and may bleed during brushing or flossing. One common association with gingivitis is bad breath, due to the bacterial buildup that often causes it. Although not all gingivitis progresses into periodontal disease, it is possible when left untreated. Periodontitis involves the decomposition of gum and bone tissue, resulting in a receding gum line as teeth are gradually shifted and loosened. Pockets of space will form between the teeth and gums, filled by additional plaque, and tooth loss may ensue. 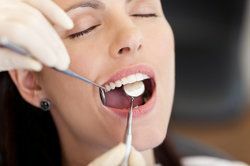 At this point, dental surgery would be needed to replace missing teeth; replacement options include dental implants, bridges, or full mouth reconstruction. Fortunately, most instances of gingivitis are resolved quickly and do not progress beyond mild inflammation when treated. Brushing and flossing: Consistent brushing and flossing is the best defense against gum disease. When plaque is not allowed to build, the primary cause of gingivitis is eliminated. Brushing twice a day, flossing once a day, and rinsing with a dentist-recommended mouthwash should keep your gums healthy. Quit smoking: As noted above, tobacco use promotes gum disease. Stopping the regular use of tobacco products is a good decision for your health overall, and an especially good one for your mouth. Visit your dentist: Seeing as gingivitis is frequently caused by plaque, the most effective treatment is to remove the plaque as fully as possible. A routine cleaning by a dental professional can remove plaque and tartar buildup significantly, allowing the inflammation to decrease over time. To keep your teeth and gums plaque-free, visit your dentist routinely for a cleaning. Dr. Bixby and his team would love to help you schedule an appointment, and are always prepared to provide you with the best technology and highest level of care. Contact us today for your next appointment!